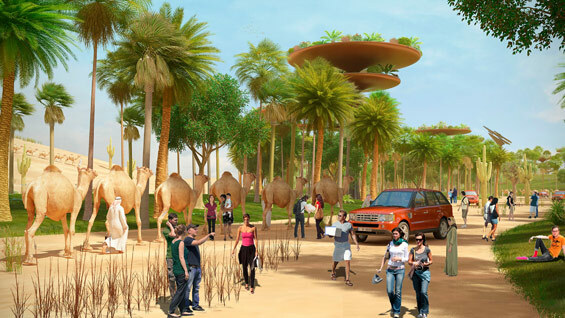 The URBAN JUNGLE is a distinctive proposal set along the entire outer edge of the Dubai Outer Road of the City, as an URBAN PARK as well as a GREEN BARRIER aiming to roll back the encroaching Arabian Desert from the southern side and to shield the city of Dubai from the constant threats of sand and dust storms, invading the city every now and then. The Arabic Bedouins have adapted their lifestyle in such extreme climatic conditions. They LIVE, BREATHE AND MOVE WITH THE SAND. Therefore this design project aims to work with their eco-system and cultural-system. The design approach is inspired by the site itself, growing out of the existing topographical features found in the sensational, dramatic curved, flowing sand dunes and mountainous features. 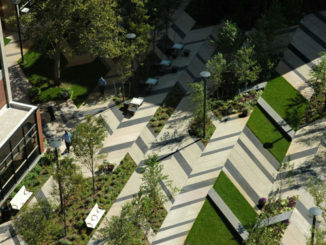 This URBAN PARK houses facilities for world-wide tourists, nomads and animals. 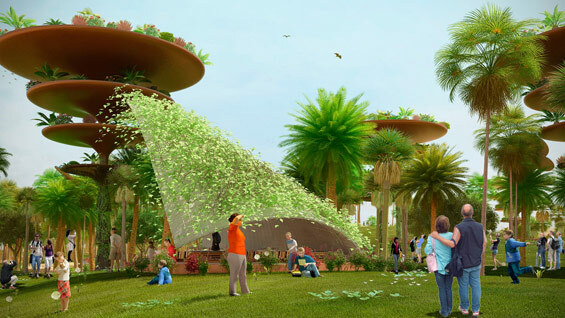 The spaces within this green barrier and urban park are connected in series, thereby presenting an open street- scape experience to the visitors in moving between the sand-dunes, balancing and blurring the interesting distinction between NATURE AND LANDSCAPE ARCHITECTURE. The aim is to approach the sands of the Arabian Desert with an acceptance towards its natural ecological conditions. The purpose is to address the massive issue of moving sands i.e. shifting of sand dunes due to sand storms causing massive destruction to road infrastructure and neighboring built and habitable environment. 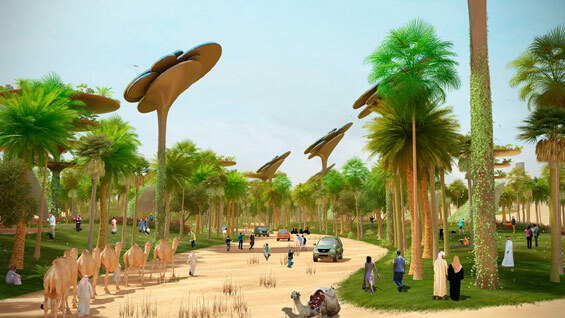 The design concentrates to shield the city of Dubai from encroaching sands by creating a green space that acts as a barrier against the encroaching desert and at the same time acts as urban park that enables especially the international tourists a closer encounter with the nomadic way of life in the Arabian Desert. 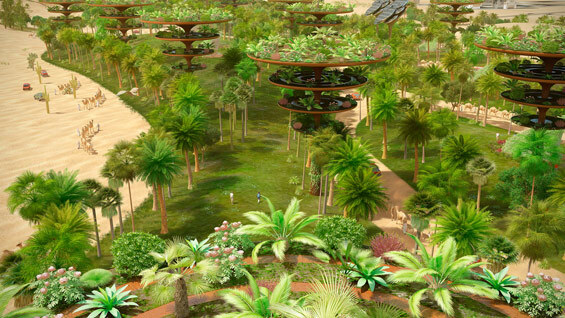 The man-made mechanical forest URBAN JUNGLE consists of supertrees such as giant artificial palm trees that act as vertical gardens and acting as air venting ducts, and solar trees generating solar power, in addition to that Picnic Shelter in the form of Bedouin tents to relieve from the scorching sun. 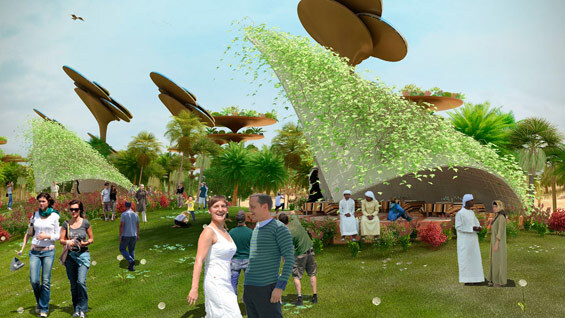 URBAN JUNGLE, at the same time, is also designed to serve as an URBAN PARK for the international tourists and the local Arabs, thereby promoting and preserving the local culture, traditions of the Arabic-Beduoins and desert-sports by presenting them at the international front. The giant artificial palm-trees draw inspiration from the native palm trees and are one effective way to maximize growing potential of the landscaping the desert. These towering giant palm-trees take the concept of vertical greenery a step further, Integrating the low-lying desert vegetation on the four leveled palm trees, that help not only to filter the air-borne sand from the incoming hot winds but also helps to reduce the temperature of the desert-wind as the wind moves through these plantations on the four levels of the giant palm-trees. These artificial trees are aesthetically striking and are a part of an ecotourism initiative of the city-state, combining form with ecologically-friendly function in a grand way. 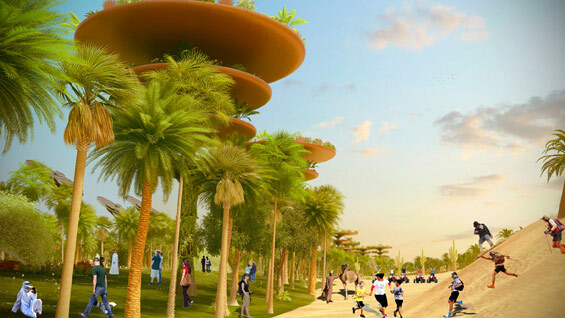 Conceived as “environmental engines” these impressive tree structures are envisioned as a natural cooling system for the wind coming from the Arabian Desert and moving towards the city of Dubai, while biomimicking the eco-functions of the trees; such as absorbing and dispersing heat, and also filtering the sand. It is also a positive step towards environmental consciousness and sustainable travel that is needed in greening the desert.